Anemometers or wind gauges have been around since the early days of the Weather Bureau. Vane anemometers combine a wind vane for airflow direction with a propeller-like device that measures wind speed. 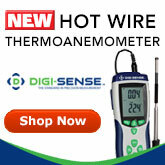 Hot-Wire Anemometers are thermal anemometers with exposed hot wires. They measure changes in wire temperature via heat lost as it is cooled by the wind, which is converted into fluid velocity. Because wind speed is an indication of a change in weather patterns, meteorologists rely on anemometers (or weather stations containing them) for wind patterns and assess how these patterns relate to humidity, pressure, and temperature. You’ll find anemometers at airports, harbors, railroads, and other locations where wind flow is important. Weather enthusiasts may use them on roofs, boats, poles, and other home installation sites.